In 1987 the world's population had just reached 5 billion. Half the world was cooking with wood and the UN Food and Agriculture Organization had just predicted that by the year 2000 there would be 2.4 billion people suffering fuelwood shortages. The twenty founders of SCI shared an enthusiasm for solar cooking. They boldly decided to try to bring solar cooking to 2.4 billion people. That goal has been a guiding beacon. For more details contact SCI. Casriga maal mahan an gaarnay cadceediyo uumi geedaan cuntada ku bislay sanaa. The modern thing we've achieved now is that we can cook our food with the sun and her heat. Cilmiga raagaaya baa cibaaradan kula sugaye awowgay wuxuna cunin adeer kay calaf ka dhigan cadceediyo uumigeedaan cuntada ku bislaysanaa. Everlasting time shows more wonders - what my grandfather had not eaten with, also my uncle did not use, but we can cook our food with the sun and her heat. Talada [alleh] caymiyaa calaacal mayeeletee cudoonaa soolarkani. The idea, with assistance of [Allah], will never fail. What a good sun. The above is part of a song sung by Chief Mostafa Omer at the graduation ceremony for the first trainers in Aisha Refugee Camp. Translated by Elyas Omer and Farah Mussa. A hot, searing wind blows from the nearby Red Sea across Aisha, a remote camp of 15,000 Somali refugees in eastern Ethiopia. Goats and camels and donkeys share this exotic land with men, women and children swathed in long, flowing clothing that protects them from the burning sun. At the request of the United Nations High Commissioner for Refugees (UNHCR), SCI launched its 4th pilot project in Aisha Refugee Camp in March 1997. SCI team members Faustine Odaba from Kenya and Louise Meyer and Bev Blum from USA spent a month in Aisha working directly with a group of refugee women, who enthusiastically and gratefully tried this new idea. SCI appreciated the abundant assistance of many staff of the UN High Commissioner in Addis and Jijiga, the Ethiopian government ARRA staff at Aisha, and the Women's Committee and chief clan leader in the camp during the initial training. Deforestation has been dramatic within the past eight years, due to gathering wood for cooking, building shelters and building fences, in that order. Local people recall that eight years ago one had to "walk single file where the camp now stands because there were so many trees." Many families report using donkeys to make weekly wood-gathering trips that last year took two days with one night in the bush, and now take three days of walking, with two nights in the bush. Those without donkeys make 8-12 hour trips to gather and carry wood on their backs every second day under the blazing sun. Initial adaptations in food preparation were done with six women, who solar cooked with good success wheat grain, pasta, rice, meat, sauces, beans, bread and tea. The only local foods that won't cook in the CooKit are injera (fermented flat bread) and deep-fried pastries. After a practice workshop we held six workshops, home visits and a second group meeting about one week after each workshop, training a total of 53 families in 2-1/2 weeks. At workshops women prepared and solar cooked food, discussed the fuelwood problem, learned the differences (habit-changes needed) for solar cooking, and assessed the solar-cooked food. Home visits were completed for only about half the families, due to weather and our tight schedule. Group meetings were held in all sections except one. At these second meetings new foods were solar cooked, women told each other about their first efforts at home, basic information was reviewed, and any problems mentioned during home visits were discussed. There are major difficulties and delays in getting essential supplies to the site and the challenge of encouraging local production of solar cookers faces many hurdles. From the first 53 families we agreed to train nineteen people, though the short time frame allowed little opportunity for them to demonstrate actual solar cooking experience and interest. The Women's Committee and the chief clan leader urged that after three months other new solar cooks would be trained. An intensive, two-day series of role-playing and practice taught 19 of the new solar cooks how to teach others about solar cooking. A first for SCI in Aisha was developing mostly-language-free record forms for trainers, using drawings in place of written words. The new trainers, though illiterate, proved they could quickly learn how to fill out these forms. At first apprehensive, then excited and confident, they each mastered the forms and received their first-ever pencil to take home. The fourth week the new trainers worked in pairs to give workshops for five of their neighbors, and were observed by one of the SCI trainers. 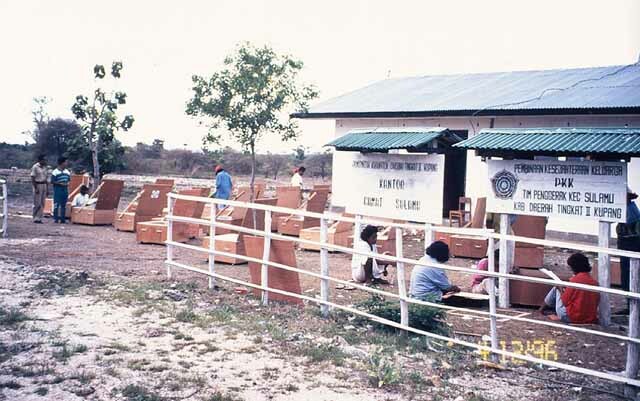 The expected supplies didn't arrive so none of these 50 new families could begin solar cooking. We hope to measure at this camp and the other pilot projects the cost-effectiveness of solar cookers, compared to alternatives, such as tree-planting and fuel-efficient stoves. In a few short years Aisha has been stripped of most vegetation, and steps are needed to restore this fragile environment to the way it was eight years ago. We also hope later to explore interest in solar water pasteurization education to reduce tuberculosis which is endemic to the region and is spread through goat and camel milk. Faustine Odaba, our trainer from Western Kenya, returned in July to interview the families with cookers. Many reported they now need only about half as much wood, saving them many trips to the bush. On July 11 Solar Cookers International completed 10 years as an organization. Looking back at the history I found that Solar Box Cookers International was founded by 15 educators, public health administrators and engineers who met at the University of the Pacific in Stockton, California, USA. These visionaries shared a convic-tion that solar cookers can benefit millions of people and stem rampant deforestation in many areas of the world. They founded SBCI "To promote solar cooking worldwide, to help people and environments." The intrepid founders were Dr. Joe Arnaboldi, Barb Blum, Bev Blum, Georgianna Borgens, Sherry Cole, Dr. Anne Funkhouser, Barbara Kerr, Don Malberg, Dr. O. Boyd Mathias, Dr. Bob Metcalf, Dave Martin, John Murphy, Margaret Payne, Eleanor Shimeall and Clark Shimeall. We and many people all over the world want to thank them for their wonderful vision. From that small beginning they gathered over 225 others as Charter Members. They can't be recognized individu-ally but they certainly get our vote of gratitude. The 1st year there were projects spearheaded by Bob Metcalf in Bolivia and Guatemala which became the group's first field learning experience. The next year the Christian Science Monitor newspaper featured the Guatemala effort and brought 2,000 requests for plans to build solar cookers. All were answered - a daunting task for a handful of volunteers. Early years also included Solarbrations on the lawn of the Capitol in Sacramento that drew several thousand people. SCI has sponsored three World Solar Cooker Conferences in the US, Costa Rica and India; has provided training and helped launch pilot projects in Central America and Africa, where over 40,000 refugees now enjoy solar-cooked meals. SCI has developed and widely disseminated teaching materials in several languages, developed the very low-cost CooKit and exchanged information with over 500 other groups around the world who also are promoting solar cooking. I could fill several pages of efforts that SCI has been involved in alone and in collaboration with other NGOs. The short historical search has been very interesting to me and I wish all of you could have the same opportunity to view your organization. It has been an active 10 years with all of you members, supporters, collaborators and especially volunteers - including independent promoters. We have a long way to go; but, looking at our progress to date, the way ahead is very promising. With your help the mission set 10 years ago will be achieved. SCI depends on you, its friends! Gracious host Professor Rodrigo Carpio provided matchless hospitality at the University of Cuenca, Ecuador, site of Segunda Conferencia Latinoamericana/Caribe de la Red Cocina Solares. It included presentations on current programs, but the primary focus was discussion on the future role and nature of networking in Latin America and the Caribbean. Axo Graphics of San Francisco has donated graphics services and a new logo for SCI, which will be unveiled at SCI's 10th Anniversary Party on October 10, 1997. SCI has set a goal of 500 new members for 1997. The campaign is well under way, with 175 new members already enrolled. Membership is important. It allows us to keep you informed through this newsletter and provides a support base for SCI. The greater our numbers of members, the stronger our base and also the more we are listened to at the United Nations and any other world forum. YOU CAN HELP! Pass this newsletter on to friends, or request some of our brochures to send to them, or send us names of people who might want to support SCI and we will follow up and send them information. Some of them will join the effort for a better, more fuel efficient world. We challenge you: enroll one new member (this can be yourself if you aren't already a member) before December 31, 1997, and we'll send you a lapel pin with our new logo at no charge. Businesses and individuals have shown remarkable ingenuity in finding ways to help SCI. Our hats are off to GOLD MINE NATURAL FOODS CO. of San Diego, California, USA. This wonderful company has dedicated 1% of their gross profits in 1997 as a contribution to SCI! THANK YOU. Let's hear from other ingenious, generous businesses. There are other ways besides actually giving money: services are equally valuable, such as transportation, hotels, copying, printing, mailing services, or tax-deductible donations of property and other assets. Whatever you do will be well appreciated by people in fuel-scarce regions who are waiting for solar cooking know-how. We sadly note the untimely passing of 13-year-old Nebaj Spitzer-Nadeau of Oaxaca, Mexico. Our hearts go out to his parents, Valerie Nadeau and Shawn Spitzer, who have sent a memorial gift to SCI that will go toward an educational scholarship. David Ciochetti was a pioneer researcher on water pasteurization together with Bob Metcalf. Bob notes, "David was a dedicated and tireless worker to spread understanding and awareness of solar cookers." He assembled hundreds of box cookers for local residents, gave demos and talks, helped produce our first video, and his Master's thesis established the guidelines for solar water pasteurization. Bob has recently taught solar water pasteurization in Zimbabwe and to refugees in Kenya. He says, "David's pioneering work is poised to help people worldwide, and it will live on." The following have remembered him with memorial gifts: the Robert Vogelsang family, Lilian Henry, Ann Henry and daughter, Melba Robinson, Gladys Vaala, Harris Vaala, Marcia Congdon and family, Harriet Norland, and Bob Metcalf. Our sincere condolences to his wife, Melanie and mother, Harriett Ciochetti. A gift to the George and Gertrude Prosser Memorial Fund was received from Gwynne P. Smith. Kakuma trainers joined the celebration of African Refugee Day (June 20) in Kakuma by having a solar cooking demonstration. They cooked and served vegetables, rice, meat, eggs, roasted peanuts and bread. Project Coordinator Gladys Ngaruye and Kenyan trainer Faustine Odaba helped serve samples of solar cooked food to many, including Mr. Ortega Pastor, UNHCR Kakuma Director, who especially liked the solar cooked bread. Each refugee family must plant and tend 15 trees for three months to earn a solar cooker. Since December 1995 over 32,000 trees have been planted, and about 2000 refugee women have received solar cookers so far, despite bad weather and lack of supplies that have slowed the process here, too. Trainers in rural Ntabazinduna are being asked to travel miles to nearby communities where people are eagerly waiting to learn about solar cooking. Bulawayo Rotary Club has agreed to support the solar cooking project in Zimbabwe with funds for conducting the workshops, distributing cookers and providing bicycles for women trainers in Ntabazinduna. After an unusually long rainy season, the training sessions resumed in May in both sites, Epworth and Ntabazinduna. Barby Pulliam, SCI international trainer, visited Zimbabwe in July-August to conduct the refresher workshops for the trainers, and to field test the new SCI Field Guide for SCI field staff. The project is currently on hold awaiting second-year funding from UNESCO, but three new sites have been chosen for expanded promotion and people are eagerly awaiting training workshops. Our first stop was Kakuma Refugee Camp, which is located in Kenyas north-west district of Turkana, bordering Ethiopia, Uganda and Sudan. Trainer Everlyne Juma from Kenya accompanied me. I will never forget seeing the Turkana people with their colorful and heavy necklaces watching us with curiosity, when our small UNHCR plane landed on the air strip. I knew Kakuma would be sunny, hot and dusty most of the time, but encountering the stifling heat and strong dust storms from the prolonged drought was something I had not imagined. We were eager to meet Kakuma Project Coordinator Gladys Ngaruye, UN staff and Lutheran World Federation staff, who manage the camp. In about an hour from our arrival we were in the camp at a solar cooking demonstration for visitors from the World Food Program, providers of refugee food rations. We held several group discussions with our trainers, all of whom are refugee women, to gather ideas to improve the project and to increase our understanding of what is actually happening in the field. We inquired about the durability of the CooKits and plastic bags and the overall impact of using solar cookers on womens lives and their communities. One young trainer, an Ethiopian refugee, said that her husband loves her more because she is healthier and happier due to using a solar cooker. Another woman said her training job kept her busy and helped her forget her disturbing thoughts regarding the camp situation. I was also touched deeply when in one of our field visits, a blind man said how his life had become easier now that he cooked his meals with solar cooker. Kakuma's refugees are remarkably diverse in languages, cultures and nationalities. It also amazed me to watch refugee women play volleyball on International Womens Day in that terrible dust storm and also to hear that the refugees even had organized writers workshops. I realized how hard these people were trying to combat the idleness and disempowerment of refugees life. It was not easy to say good bye to these people with whom we had shared misery and happiness only for a couple of weeks. Next, we visited Dadaab, a refugee camp in eastern Kenya very near the Somalia border. Thanks to extensive tree-planting, there are now some green oases with interesting birds among the vast, sandy areas where goats and camels roam freely. The camp is managed by CARE International, and our partner agency GTZ, a German development organization. GTZs hospitality, punctuality and its well organized operation made our trip very productive and enjoyable. Again after five intense days of field visits and group discussions with 52 solar cooking trainers, we were impressed with the intelligence and enthusiasm of the refugee women. "Traditionally it has been difficult for our husbands to cook with the fire, but now they like cooking with a solar cooker." "Due to our training jobs we are more respected in the community now and we enjoy being leaders ourselves." At a Community Skills Development Project run by CARE International we met a group of women who are using solar cookers to dye the reeds to make colorful baskets, mats and hats. My last stop was in Zimbabwe. Here again we held group discussions with the women trainers in the two pilot communities, peri-urban Epworth and rural Ntabazinduna. One of the young Epworth trainers said that she had a new identity now that she was teaching and empowering other women to do solar cooking. The women trainers appear to be fully persuaded of the usefulness and positive impact of using solar cookers on their lives and community as a whole. They report saving firewood, money and time, and appreciate the convenience and better food taste. They also stressed that the whole family was happier and they felt better about themselves due to the training jobs. The majority of the trainers in Kakuma and Dadaab said they use solar cookers more than three times per week. In Zimbabwe they use cookers every day if the weather is good. One problem is that plastic bags wear out fairly quickly, so that a family will need a dozen or more per year. We recommend that six plastic bags should be included with cookers sold rather than just two. Also, staff in both Kakuma and Dadaab have arranged to make bags more available and affordable to solar cooks. Another problem is the small size of the cooker for large families. We produced larger cookers for extended families in Kakuma and are weighing these against the alternative of two regular-sized cookers for these larger families. Having direct contact with refugees and feeling that we at SCI are making their hard lives easier made my trip very rewarding. SCI was proud to be part of an elite exhibit on environmental success stories for UN General Assembly delegates. A special meeting was held in June to review progress since the Environmental Summit in Rio de Janero in 1992. Volunteers Linda Helm Krapf, Barbara Knudson, Bob Larson, Bob Metcalf, Louise Meyer contributed many hours to answering questions at the exhibit. Knudson, Larson, and Metcalf had helped staff an equally exciting exhibit at the Rio Summit five years ago. "While governments have dithered at a pace that could make drifting continents impatient, people have acted. Birthrates are dropping faster than expected, not because of Rio but because poor people are deciding on their own to limit family size. Another positive development has been a growing environmental consciousness among the poor. From slum dwellers in Karachi, Pakistan, to colonists in Rondônia, Brazil, urban poor and rural peasants alike seem to realize that they pay the biggest price for pollution and deforestation. There is cause for hope as well in the growing recognition among business people that it is not in their long-term interest to fight environmental reforms." In a speech by UNESCO's Secretary General, Federico Mayor, he contrasted the $900 billion spent annually by nations on war armaments with low-cost, nonviolent solutions toward social justice, specifically mentioning solar cooking as one such solution. SCI has received $23,671 from Alternative Gifts International which it raised for SCI through its catalog of charitable giving. This gift is specifically designated to provide 658 solar cookers for refugees in Kenya and Ethiopia. For an AGI catalog send your name and address to Solar Cookers International. California state employees and other organizations that allow payroll deductions through Earthshare can now designate gifts directly to SCI. Many companies match their employees' charitable gifts, a great way to double your impact. We reluctantly bid fond adieu to Kevin Coyle, our part-time Resources Development Coordinator for seven years. Kevin increased annual donations nearly ten-fold during that time. Kevin has also been our primary correspondent/ consultant with members overseas, answering thousands of inquiries about all aspects of solar cooking and SCI's programs. Kevin's generosity has been in both spirit and time, as he "tithed" a donation to SCI by volunteering extra hours. A letter from SCI member Lydia Walz says it all: "Your extraordinarily kind thank you letter to me today put me and my co-workers into happy tears. I love what you and SCI do and hope to support it for years to come. I hope someone sends you a million bucks this year!" When Kevin announced his plans to retire we decided to make the leap to our first full-time fund raiser. SCI is pleased to announce the hiring of Dr. Ronald Sommer as our Development Director. A graduate of the London School of Economics, he brings many years' experience working with non-profit agencies in fund raising, management and as a consultant. October 10, 1997 SCI's 10th Anniversary Celebration, Sacramento, CA (see front page). Oct. 18, 1997 5th National Tour of Solar Homes: 400 solar-powered homes in 36 states of the USA will be open to the public. Sponsored by Am. Solar Energy Society and US Dept. of Energy. Tel. 303-443-3130, e-mail: ases@ases.org. The London Times ran an article July 9, 1997. Escapees Magazine for "RVers" (people who travel in motor homes and recreation vehicles) included an article by Tom and Nancy Vineski. The Osgood Files of CBS will air an interview with Bob Metcalf and Bev Blum in September. CooKits are now offered in the Real Goods Catalog Renewable Supplement. Member Aruna M. Jarju of the Gambia Renewable Energy Centre is seeking funding to popularise the use of solar cookers in the Gambia. The government hopes to reduce dependence on fuelwood for cooking, save forests, save women's time, and reduce smoke-related diseases. For inf. : Ministry of Trade, Industry and Employment, Independence Drive, Banjul, Gambia, tel 220-292 838, fax 220-229 220 or 220-227 756. The Gambia Government Renewable Energy Centre is seeking funding to popularise the use of solar cookers in the Gambia. They hope to reduce dependence on fuelwood for cooking, save forests, save women's time, and reduce smoke related diseases. For inf. : Ministry of Trade, Industry & Employment, Independence Drive, Banjul, Gambia, tel 220-392 838, fax 220-229 220 or 220-227 756. GREECE Member John Balafoutis manufactures and sells an attractive, portable Solar Oven that is nearly indestructible. It is available for $180 to $230 US, by Solar Systems, which won the 1995 Eurosolar Award. . It is a 3-reflector box type weighing 8.2 kg. His European customers thank him for a way to cook safely, ecologically, conveniently and with no fuel. Balafoutis now has also introduced a larger model to cook for ten or more people at a time. For inf. : Solar Systems, Pentzeridi 1, 145 65 Ag. Stefanos, Attikis, Greece. Tel. 30-1-6216-810, fax 6216-548. In USA: Ballas Engineering, tel. 847-843-3500, ext. 206, or fax 847-843-1258. LESOTHO Steve Lapp writes that Bethel Business and Community Development Centre in Bethel is working with many appropriate technologies. Students make and sell solar cookers - 45 so far. For inf. : Ivan Yaholnitsky, BBCDC, Box 53, Mt. Moorosi 750, Lesotho. SIERRA LEONE Ed. 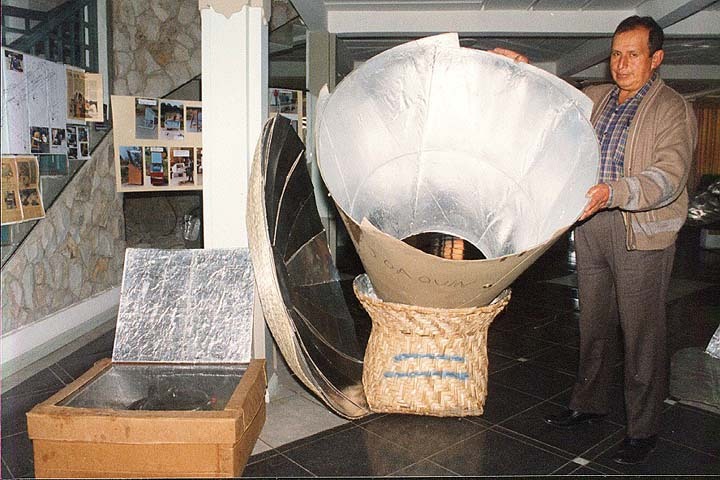 F. Milton Margai, Sr., first received solar cooker training from Bob Metcalf in Kenya in 1992. He writes that during recent political turmoil their building and equipment were greatly damaged. They appeal for donations of appropriate technologies to resume their activities. For inf. : Albert Margai Inst. of Design, Crafts and Appropriate Technology (AMIDCAT), c/o PMB 57, Freetown, Sierra Leone. SPAIN Manos Unidas teaches people how to build solar cookers from milk cartons. Spanish President José Maria Azwa recently visited and was greatly interested in their work. For inf. : Manos Unidas, Campaña Contra el Hambre, Barquillo, 38 - 2.º - 28004, Madrid, Spain. Tel. 308-20 20. fax 308-42 08. Aranya Lema in Dar es Salaam has made box cookers from metal, and helped other women make them from paper. For inf. : PO Box 3878, Dar es Salaam, Tanzania. Ellerton A Mwamasika of the Ilemi Secondary School has helped about 20 families build solar cookers. About six months of the year are good for solar cooking in Mbeya where he lives. For inf. : PO Box 2433, Mbeya, Tanzania, tel. 2549. Solomon Njabu of the Vwawa Vocational Training Center in Mbozi has helped ten families build solar cookers. For inf. : Soloman Mjoba, PO Box 425, Mbozi, Tanzania. TOGO A group of young men have formed Foyer Solaire to promote solar cooking. For inf. : Djogoessa K.D. Boniface, Foyer Solaire, BP 61971, Lomé, Togo. UGANDA Edward Sembajjwe, Managing Director of Disabled Technocians Uganda Limited, tested the CooKit in Uganda and reported it cooked matoke and sweet potatoes in 2-1/2 hours but clouds prevented his cooking rice. For inf. : Edward Sembajjwe, DTU Ltd., PO Box 30895, Kampala, Uganda. ZIMBABWE The Rotary Club of Bulawayo is planning a solar cooker project in cooperation with the UNESCO-sponsored project coordinated by the Development Technology Centre at the University of Zimbabwe. For inf. : DTC, PO Box MP167, Harare, Zimbabwe, fax 263-4-303 544. CANADA Craig Shearer of Solar Freedom International sells solar ovens and also blueprints to build them as well as other household solar devices. He estimates over 900 cookers have been built as a result of SFI's work. For inf. : SFI, Box 7103, Saskatoon, Sask., Canada S7K4S1, tel/fax 306-652-1442. Blue prints are $15 Canadian and cookers are $325. COSTA RICA AND NICARAGUA: CASEP (Central American Solar Energy Project) announces two new centers for solar cooking and allied activities. Costa Rican Coordinator Juan Arriaga (also an SCI Honorary Advisor) and the women of Sol de Vida have obtained a plot of land and a small building near Oriente, Guanacaste in Costa Rica. In Nicaragua, Coordinators Karen Allgeier and Marta Rocha, found a small farm between Massaya and Grenada. For inf. in USA: CASEP, tel./fax 703-273-1435. 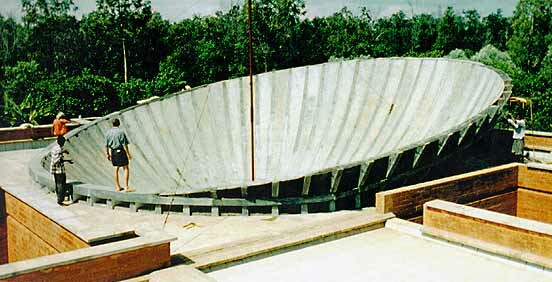 GUATEMALA Joseph Reid reports that Monte Casita Centro Ecologico, founded by Peter Meyer, continues to promote solar cooking, primarily the SK12 parabolic dish type which sells for about $166 US. Peter also reports a nutrition center in Jutiapa is cooking nutritious meals for undernourished children and a hospital in "Tucuru, Alta Verapaz is pasteurising large quantities of water. For inf. : Apdo Postal #218, La Antigua, Guatemala 03901, Central America. MEXICO Earl H. Davis of the Tucson Black Chamber of Commerce took several CooKits to Alamos, Sonora. The owners of a seafood restaurant found it is easy to cook shrimp in one. For inf. 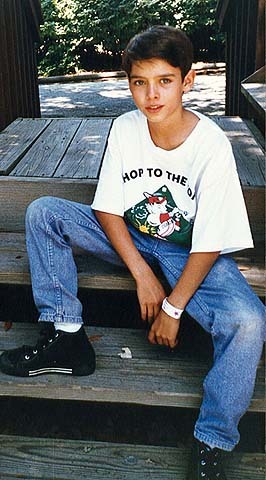 : Earl H. Davis, 5414C E. Bellevue St., Tucson, AZ 85712-4942 USA. Laurie Loeb reports that she, Ed Eaton and Laurie Stone, all of Solar Energy International (SEI), worked with the Fundacion Apoyo Infantil, Sonora, Mexico to initiate a commercial solar bakery in Obregon with large, 3-reflector box cookers. Women are cooking whole-grain rolls, empanadas, cookies, cakes, other pastries and pizzas to sell. Squaw Peak School in Phoenix taught 6th and 7th graders how to make and use solar cookers. One boy cooked some food in a pot in a plastic bag in an old tire! Dr. Paul Funk, long-time researcher and designer of solar cookers, has been awarded the Robert E. Stewart Engineering-Humanities Award from the American Society for Agricultural Engineering (ASAE). CALIFORNIA SCI founders Clark and Eleanor Shimeall held a Strawbale House Workshop and Solar Cooking Demonstration at the Borrego Springs home in August. For inf. : PO Box 1022, Borrego Springs, CA 92004, tel 760-767-3272. DISTRICT OF COLUMBIA Linda Salvo and Jeff Gilbert received 2 grants from the Environmental Protection Agency: the first to teach children, and the second to teach trainers employed by the Parks and Recreation Dept. in Virginia to teach children and summer camp participants all about solar energy, including solar cooking. The pizza looks great! David Hughes of Zomeworks is selling the rights to manufacture and sell its Sunflash Solar Oven. The sale includes all customized jigs, parts list, supplier and vendor lists. The sale also includes factory help for start up. Asking price is $6000 US. For inf. : Zomeworks, PO Box 25805, Albuquerque, NM 87125, tel 800-279-6342 or 505-242-5354. NEW YORK The inmates of the Ogdensburg Correctional Facility has donated $50 to SCI. To raise this money these men collected 1000 empty soft drink cans and bottles, which took about six weeks. We are most grateful. SOUTH DAKOTA Member Mildred McCloskey writes of recently rediscovering the fireless cooker (also known as a hay box) in a book published in 1913. This fireless cooker finishes cooking a large pot of food or soup with no more fuel, once it has been heated to boiling. She crumpled newspaper in the bottom of a cardboard box, put the pot of food in it, added crumpled newspaper around the sides, covered it and left it overnight. In the morning the food was cooked. It is especially recommended for cooking cabbage because it can keep the aroma of cabbage out of the house. Thanks, Mildred. VIRGINIA Dennis Talton, Naval Facilities Engineer, has given presentations on solar energy at Hermitage Elementary School in Virginia Beach for several years. He reports in the American Society for Engineering Education Newsletter that a third-grade student, Mark Mathena, Jr. was inspired to build a solar cooker which he demonstrated to others in his school. INDIA Mrs. M. Basanti Rao received training by IREDA and has helped over 25 people build solar box cookers. She reports her district is now semi-arid due to widespread deforestation. For inf: Sunanda Solar Systems, c/o Engg College Campus, 15.Vidya Nagar, Anantapur, Andhra Pradesh, India, tel. 32425. Emmalvelle Taijman, living near Mysore, India has introduced solar cooking in several communities. She notes that middle class families are the first to try it and appreciate its fuel-saving possibilities. For inf. : Emmanvelle Taijman, 3460 17th St., San Francisco, CA 94110 USA. The Calcutta Rotary Clubs are supporting a project to produce Richard Wareham's SUNSTOVE in Calcutta, India. For inf. : R.Wareham, 3140 North Lilly Road, Brookfield WI 53005, tel. 414-781-1689, fax 414-781-0455. TIBET Dr. Zhang Jie, Director of the Solar Energy Research and Demonstration Centre of Tibet, recently visited SCI during a tour of the USA. She reports 70,000 solar cookers have been distributed in Tibet. These are mostly concentrator types with a trough shape. Local cooks also tested box-type cookers, but greatly preferred the concentrators. 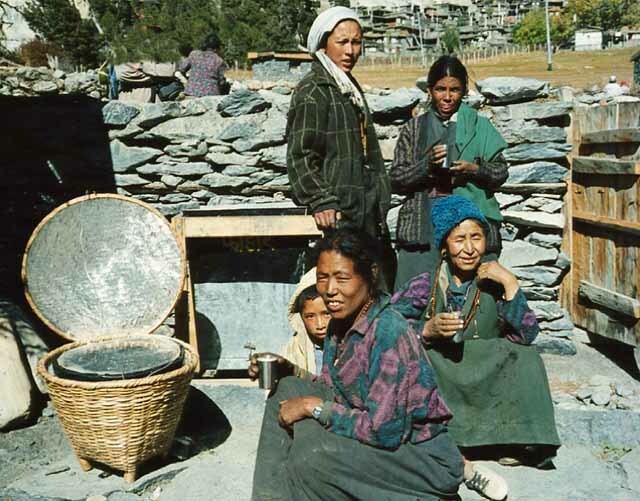 The traditional diet and cooking in Tibet involves boiling large quantities of water. In the early years, solar cookers were subsidized, but for the last several years the cookers are sold with no subsidy for the equivalent of $60 US. Five companies in China produce them for the growing market. Zhang noted that Solar cooking seems to be more popular in agricultural communities, since it replaces dried dung, which farmers would rather use to replenish their soil. Herding communities have less need to conserve dung. 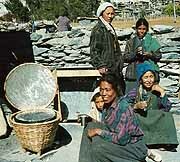 Tibet lies in the "rain shadow" of the Himalayas, so the solar cooking season lasts nearly the entire year. For inf. : Solar Energy Research and Demonstration Center of Tibet, 230 Beijing West Road, Lhasa, Tibet 850 001, China. 1. One-fourth of humanity suffers fuel scarcities. Half of the world cooks with wood. Accelerating wood shortages in many countries add new burdens to families, particularly in eastern and southern Africa. Families must be fed every day. Rural women of all ages - including those who are pregnant and have infants, the elderly, and very young girls who should be in school - spend more time and walk ever-longer distances to find, then carry, heavy loads of wood. Urban families in many developing countries now spend up to a third of their income for cooking fuel. Refugees in Kenya, prior to getting solar cookers, often barter away part of their food rations to get fuel to cook the remainder. Many families are unable to cook nutritious foods such as beans and maize, which require hours of cooking, and substitute less nutritious, faster cooking foods such as pasta. Families are also less able to heat/pasteurize their water and milk to reduce water borne-diseases, the major killers of children. Solar cookers easily cook most foods and pasteurize milk and water. Fuel-gathering is one factor in the tide of migration to cities. A rural Zimbabwean summed up the possibilities: "Today many young Zimbabwe women don't want to stay in rural areas because gathering fuelwood is so difficult and time-consuming. Solar cookers can make rural life easier for women so they'll want to stay there." The annual per capita wood consumption for cooking in most parts of the world is about .5 ton (1.32 kg per day), or about 3 tons per family of six people. A solar cooker can save one ton of wood per year. The cost to replace cut trees in India is double the market price of cut wood. Many governments including Zimbabwe and Kenya import and subsidize less sustainable fuels at great expense. 2. Current cooking methods are unhealthy, unsustainable and unavailable to future generations. Smoke causes lung and eye diseases. Future generations will have fewer options. Historically most solar cookers were either curved parabolic reflectors focusing intense heat onto a single pot, or heat trap boxes with a window on the top and one or several flat reflectors. Both types were too expensive for most people, cumbersome and sometimes even dangerous to use. A wide variety of new solar cookers are more convenient, much lower-priced, and now competitive with alternatives such as wood, charcoal, and wood stoves. One such model, an open reflector, has been widely tested and has proven useful in the USA, Kenya and Zimbabwe. It pays for itself in fuel savings in two months or less and becomes a recurrent economic benefit to individual households. Developed in 1994 by an international team of volunteers and dubbed the "CooKit," it is ideal for introducing the basics of solar cooking. It is easily hand-made and also is being mass-produced in USA, Kenya and Zimbabwe with modifications to suit local needs and climates. Participative instruction quickly teaches solar cooking skills and trains local women to also teach their neighbors. Many millions are waiting for the simple, life-long skill that they can pass on to future generations. Solar cooking deserves new attention. 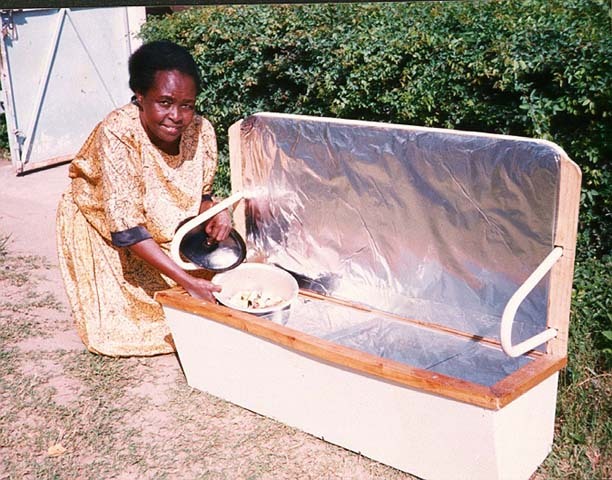 In the next issue watch for "Top 10 countries for solar cooking." "Hope has two beautiful daughters. Their names are anger and courage. Anger at the way things are and courage to see that things do not remain the way they are." 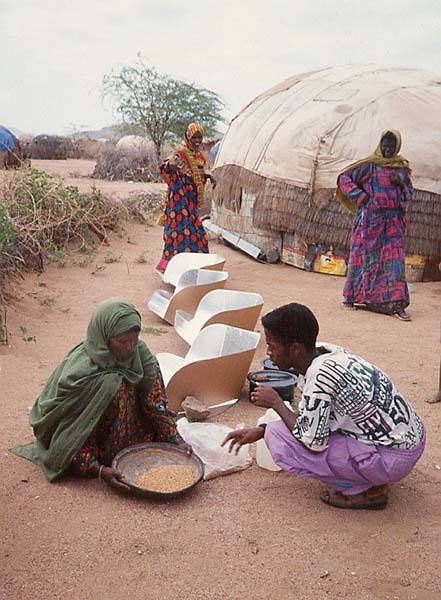 The Solar Cooker Review is published three times a year to provide news from around the world on solar cookers, their uses, projects to disseminate them, and successful adaptations to diverse social and cultural needs. The Review includes both news briefs and longer interviews and articles about researchers, field program leaders, and advocates. Solar Cookers Review is sent to all SCI members. A donation makes you a member. Subscription for non-members in USA and Canada is $10 per year. Single copies are available to selected libraries and institutions overseas. MOVING? Please let us know your new address. You'll save SCI $1 US to pay for your returned newsletter and to re-send it. - rarely funds or manages solar cooking projects in the field, except for occasional research and/or as pilot demonstration projects. SCI support comes mostly from individual donations; other sources are sales of cookers and education materials, fees for training, and grants from private foundations. SCI's goal by the Year 2000 is that 2,400 million people will be aware of solar cookers and at least one percent, 24 million, will be using solar cookers. This will save 3.2 million tons of firewood per year, reduce emissions of millions of tons of carbon dioxide per year, improve health and relieve heavy burdens caused by growing fuel shortages in many arid parts of the world.